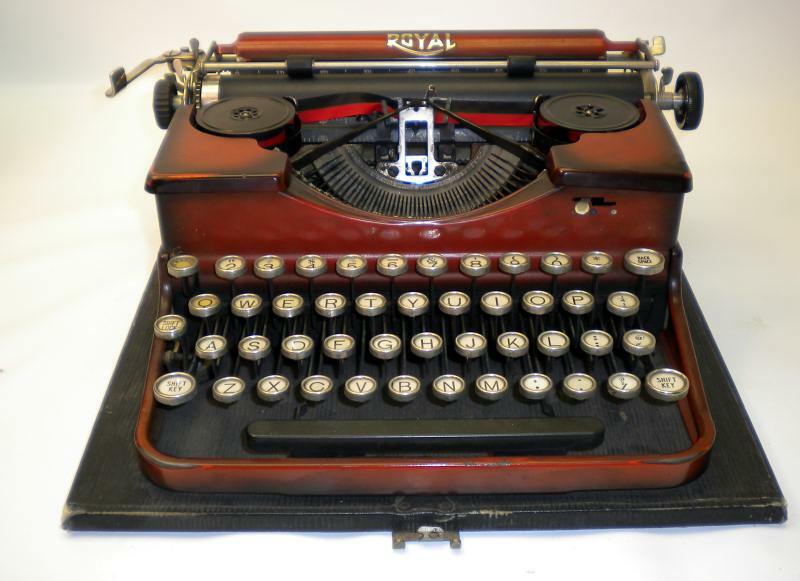 So, you may have noticed that I have a thing about typewriters… Years ago I passed up a typewriter described as Ox-blood red and have regretted it ever since. When I made the Kowal Portable, I based it on the Ox-blood red machine. This is not the exact model typewriter that I passed on, but it has the same paint job. It is a thing of beauty and will be arriving at our house next week. This is a Duotone Royal from, probably, the 1930s. One of the very cool things about it is that it has sans serif type. I think all of our other machines are serifed. Am I a geek? Yes, I am. Do I mind? No, I do not. The paper rollers are a little flattened but we have a good repairman who can probably swap them out. As I was telling a friend, the silly thing is that I don’t actually compose fiction on these although I keep meaning to give it a try. I just love the way they are beautiful and utilitarian at the same time. Can you believe the school I work at does not have a single typewriter? One of my colleagues needed to fill out a preprinted form for something or other, so she went to the secretary and asked where she might find a typewriter. The secretary stared at her like she was an alien. A typewriter?! We don’t have any of those! My first typewriter was a manual one. When I finally got to type on an IBM Selectric, on the one hand, I thought it was practically luxurious how it didn’t matter what force I hit the key with, a letter typed, at the same darkness each time. (I also thought that ball, instead of the hammers, was wild!) On the other hand, I no longer “felt” the physics of the hammer blow, you know? Kind of like driving a car with power everything and automatic transmission versus one with power nothing and a stick shift. I think one of our typewriters when I was a kid *could* do duotone, if you put the right ribbon in, but I don’t remember it too clearly. One artifact of my having learned to type on a manual is that I hit the keys freaking hard! You can hear me banging on the computer from across the house! A world without typewriters… It’s funny how many things still need to be filled out in triplicate. I’ve never seen one of those. All the ones I’ve seen has serif types (that bears some resemblance to Courier). The only time that I’ve actually used a typewriter for anything was filling out my college application. But even that wasn’t a manual. It wasn’t uncommon for offices to have machines with different typefaces. I saw a 14 pt Times New Roman machine once, which was very cool but not easy to justify buying. That’s a beautiful machine. It cuts me to the core every time I see one like it on eBay, and the seller writes “Will cut off and send just the keys”. The guy running the repair shop in Boston says he’s had a lot of young customers lately…teenagers, even. He says there’s one 16-year-old girl who has twenty or thirty typewriters. The typewriter may be on life support, but it isn’t quite dead yet. I know what you mean. I don’t mind it so much when the machine is really common or damaged but sometimes they just don’t know what they have. This one actually comes from a collector who is thinning his collection. So his “fair” condition is really good. We were terrified that our typewriter repairman would have gone under while we were out of town but he’s still going strong. The shop has been there forever. 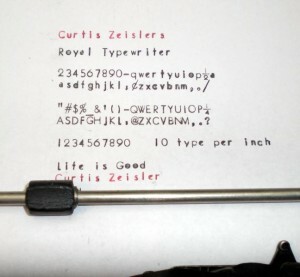 I have an old IBM Selectric clone (by Sears) that I still use for typing up address labels and envelopes. There’s some things you just can’t do well with a printer. It technically belongs to my daughter, but since she has a computer now, I have claimed it. She doesn’t seem to mind. My Aunt had an ancient upright typewriter — you know the kind, they are huge and weigh about 30 pounds. She was one of the early typists, and was very proud of the business degree she earned in the 20s.